Boom lifts, also known as bucket trucks or cherry pickers, are widely used in construction and general industry. Even though boom lifts are generally safer than ladders, more than 26 workers are killed every year in accidents. 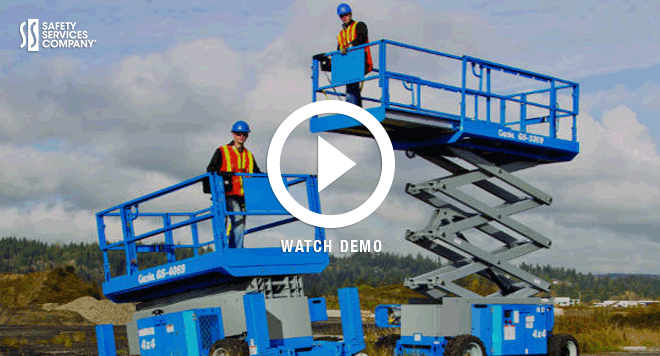 The most common accidents and fatalities related to boom lifts are electrocution and falls. To protect workers, OSHA has established a series of regulations governing the use of lifts (1926.451, 1926.452, 1926.453, and 1926.454.) These OSHA safety training regulations for lifts include securing the boom or ladder in the stored position when the vehicle is in motion, requiring employees to wear fall protection devices attached to the bucket or boom, and obeying weight limits of the boom and bucket posted by the manufacturer. Here at Safety Services, we have developed a “Do-It-Yourself” training program that is both simple to administer and will meet all your OSHA requirements. Classroom/online training – The first step of our program is an intuitive electronic training session. Through the program, employees can navigate a computer based training program at their own pace, and then take an automatically graded test. The kit also includes presentations and printable student handouts that your instructor can use for classroom lecture presentations to groups of students. Field training – The second step of training is in the field. During this portion of the session, your appointed trainer shows the trainee the workplace applications of the materials they learned in the classroom session. Evaluation – The third step to the training session is evaluation. Through this step, the trainer either evaluates the trainee and signs off on certification or retouches on topics that need more work. Our Boom Lift training program allows you to ensure that your company is currently compliant, and will remain that way in the future. Now is the time to make sure your employees, capital assets, and your business are protected. Effective safety training will ensure your employees are qualified and safe. All certification through the program meets OSHA requirements. If you have questions about safety meeting topics, or are ready to order our Boom Lift training kit, give us a call at (888) 247-6137 today to speak with one of our safety solutions experts.